Introduction: Some surgeons perform routine preoperative screening endoscopy in all patients undergoing bariatric surgery. Various pathologies have been noted and reported during preoperative endoscopy. 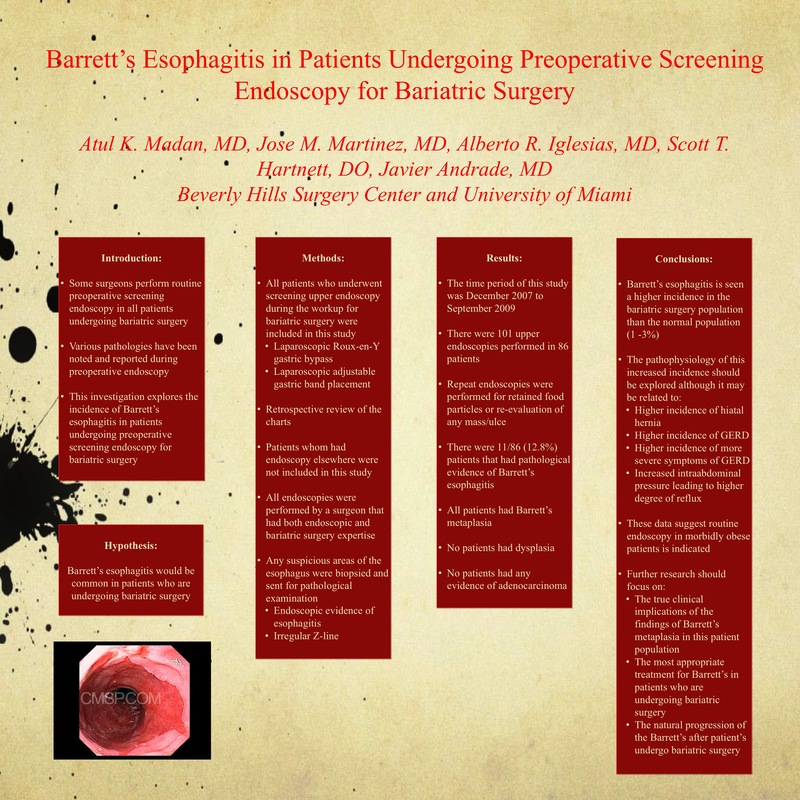 This investigation explores the incidence of Barrett’s esophagitis in patients undergoing preoperative screening endoscopy for bariatric surgery. The hypothesis that was tested was that Barrett’s esophagitis would be common in patients who are undergoing bariatric surgery. Methods: All patients who underwent screening upper endoscopy during the workup for bariatric surgery were included in this study. Patients whom had endoscopy elsewhere were not included in this study. Any suspicious areas of the esophagus were biopsied and sent for pathological examination. Results: The time period of this study was December 2007 to September 2009. There were 101 upper endoscopies performed in 86 patients. Repeat endoscopies were performed for retained food particles or re-evaluation of a mass/ulcer. There were 11 (12.8%) patients that had pathological evidence of Barrett’s esophagitis. All patients had Barrett’s metaplasia and no patients had dysplasia. Conclusions: Barrett’s esophagitis is seen a higher incidence in the bariatric surgery population than the normal population. The pathophysiology of this increased incidence should be explored. Additionally, these data suggest routine endoscopy in morbidly obese patients may be indicated. Lastly, further research should focus on the true clinical implications of the findings of Barrett’s metaplasia in this patient population.